For the seventh straight year T S Restaurants’ Hula Grill, Duke’s Beach House, Kimo’s and Leilani’s will serve as title sponsors of the XTERRA Kapalua Trail Runs in Maui. 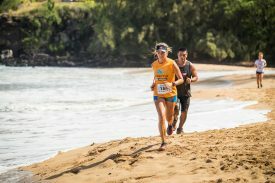 Honolulu, HI – For the seventh straight year T S Restaurants’ Hula Grill, Duke’s Beach House, Kimo’s and Leilani’s will serve as title sponsors of the XTERRA Kapalua Trail Runs in Maui. With four runs to choose from there is a distance and challenge for every member of the family. Go big or start small with Kimo’s XTERRA Keiki K, Leilani’s XTERRA 3.3K Sprint & Beach Scramble, the Hula Grill XTERRA 5K or Duke’s Beach House XTERRA 10K trail runs. Held in conjunction with the 22nd running of the XTERRA World Championship triathlon, the Kapalua runs are an opportunity for outdoor enthusiasts of all ages and skill levels to get involved and experience the legendary XTERRA run course. The Kimo’s XTERRA Keiki Run is for boys and girls ages 10 and younger. It is free, although parents must be present to sign a waiver form at the site of the race. Race distances vary from 100 yards to 1-kilometer, depending on the age of the child. Parents are welcome to stay on the course as well. The Leilani’s XTERRA 3.3K Sprint & Scramble is a test of agility, speed, and strength as it goes from the Ritz to the Ravine to the soft sand of D.T. Fleming Beach. Kids 8-12 run for free, but it’s open to everyone. The Hula Grill XTERRA 5K is an honest three-miles of climbing and descending and for those up to the challenge, the Duke’s Beach House XTERRA 10K dishes out big hills and dusty trails as it twists through oleander forests to an unexpected mountain lake at the 700-foot level then sends runners crashing down to the shoreline. “They are all awesome races, and the vibe around The Ritz-Carlton rocks on Saturday morning,” said XTERRA President Janet Clark. In addition to the trail runs a Paul Mitchell cut-a-thon will be held at the site of the race where runners and spectators alike are welcome to get their hair cut by professional Paul Mitchell stylists, with all donations benefitting the Challenged Athlete Foundation. More than 1,000 runners from around the world will take part in one of the four events, and to the winners go the spoils as the first-place man and woman overall and the first-place male and female Maui resident (if different) in the 10K, 5K, and 3.3K win T S Restaurant gift certificates worth $100. There is also an internal struggle going on, as employees from T S Restaurants created a race within a race dubbed “The T S Restaurants XTERRA Challenge” in which each of the four restaurants field a team of 5 runners; and the team with the fastest cumulative time in the 5K take home the coveted T S Trophy. Last year, Kimo’s captured the perpetual trophy for the third year in a row and have it proudly displayed in their restaurant for all to see. Hula Grill won the titles in 2012 & 2013 and Duke’s Beach House captured the inaugural challenge in 2011. Founded in 1977 by Rob Thibaut and Sandy Saxten, T S Restaurants owns and operates 13 restaurants in Hawaii and California, including Duke’s Waikiki and Hula Grill Waikiki on Oahu; Kimo’s, Leilani’s on the Beach, Hula Grill Ka’anapali and Duke’s Beach House on Maui; Duke’s Kauai and Keoki’s Paradise on Kauai; and Jake’s Del Mar, Sunnyside Restaurant and Lodge, Duke’s La Jolla, Duke’s Huntington Beach and Duke’s Malibu in California. For more information visit www.tsrestaurants.com.